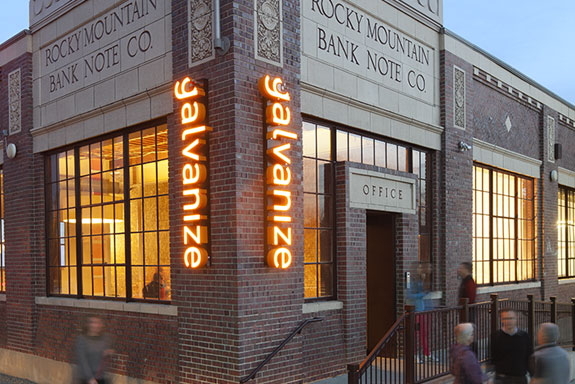 Galvanize, the Denver-based startup incubator/co-working space, has raised $13.1 million in a recent funding round, according to documents filed with the SEC. The filing indicates the company is attempting to raise $18 million and has 23 investors so far, so that amount could grow. Galvanize representatives declined to comment about the news Friday morning. But the company is in the middle of a major expansion that would see it grow to five locations over the next year or so, so it’s easy to see why the cash would be handy. Galvanize has become a major hub of the Denver startup scene since it opened in a restored 30,000-square-foot historic building in the Golden Triangle neighborhood in the fall of 2012. Startups such as Uber, Roximity, Closely, and Active Junky have or had offices at the site. Numerous other startups and individual entrepreneurs have desks at the facility. Galvanize also has hosted countless events, such as the monthly Denver New Tech Meetup, last weekend’s Hack4Colorado hackathon, and Google for Entrepreneurs’ Denver event last summer. Google was impressed enough with Galvanize that it made it one of just seven partners in its “tech hub” network when the program began last year. The company has big plans to expand in the Mile High City and beyond. It is building a new facility just north of downtown Denver, and it opened a space in Boulder a few weeks ago. Galvanize recently announced plans to expand to Fort Collins. It also is extending its reach beyond Colorado. In January, it opened a location in San Francisco’s South of Market neighborhood. But Galvanize isn’t just about real estate and building stylish co-working places. It also hosts a school for coders and software developers dubbed “the gSchool” and has created its own seed fund. According to another SEC filing, the Galvanize Venture Fund is looking to raise $7.5 million. Galvanize co-founders Jim Deters, Chris Onan, and Lawrence Mandes are listed as the fund’s managing directors on its website, and they are on the lookout for startups to invest in.